Please send me e-mail with corrections, info, photos, etc. Reworking the transformers requires some patience, a heat gun to soften the old epoxy and some small tools to dig the softened epoxy out of the forms. 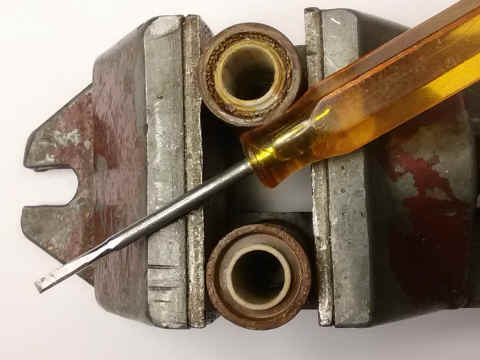 All can be done without breaking anything so that the repaired transformer can be reassembled and appear to be as new. 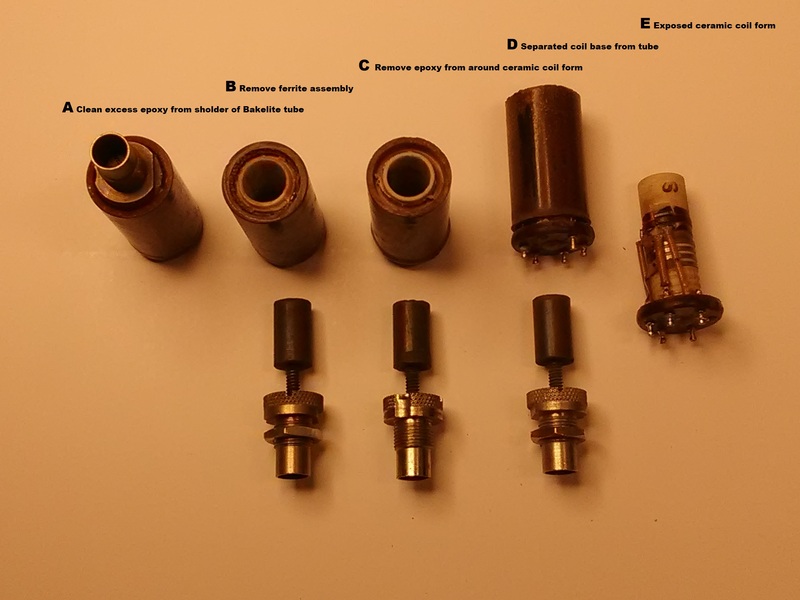 I have a few old transformers if some need replacement parts. I have found that there are really only two types of RF transformers: Oscillator and Amplifier. All amplifier transformers are electrically the same if they are of the same frequency range. Physically they are keyed to fit the particular module and a small Swiss file will add a new notch so that the transformer can be rotated to the proper orientation when installed in a different module. These photos are in the same vein as the Family Handyman “Wordless Workshop” series of projects. First photo shows the steps in the operation. Second photo shows how to use a pair of long nose pliers and a screwdriver to leverage the heated leadscrew out of the phenolic shell. Easy does it as little pressure is needed. 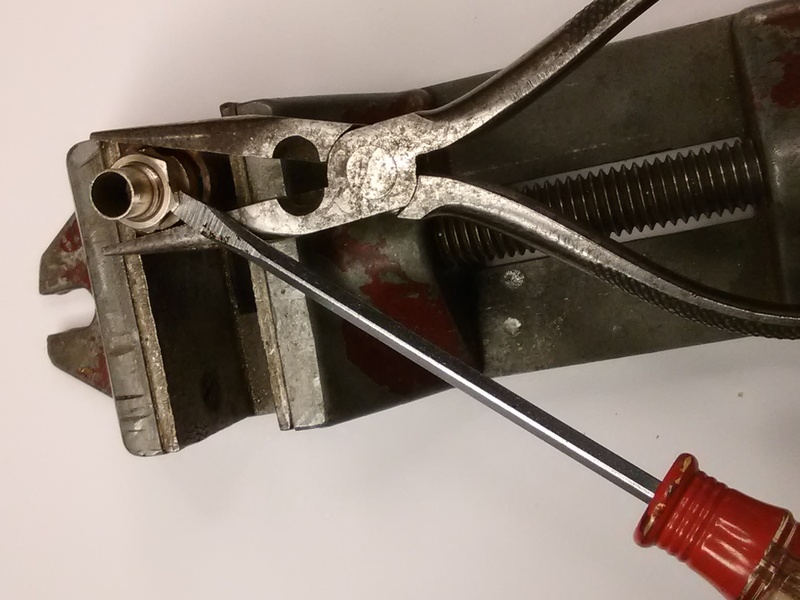 Heat again as needed to soften the epoxy and change the position of pliers and screwdriver as necessary to rock the leadscrew out of the phenolic shell. Third photo shows the before and after of cleaning the residue epoxy from the phenolic shell. 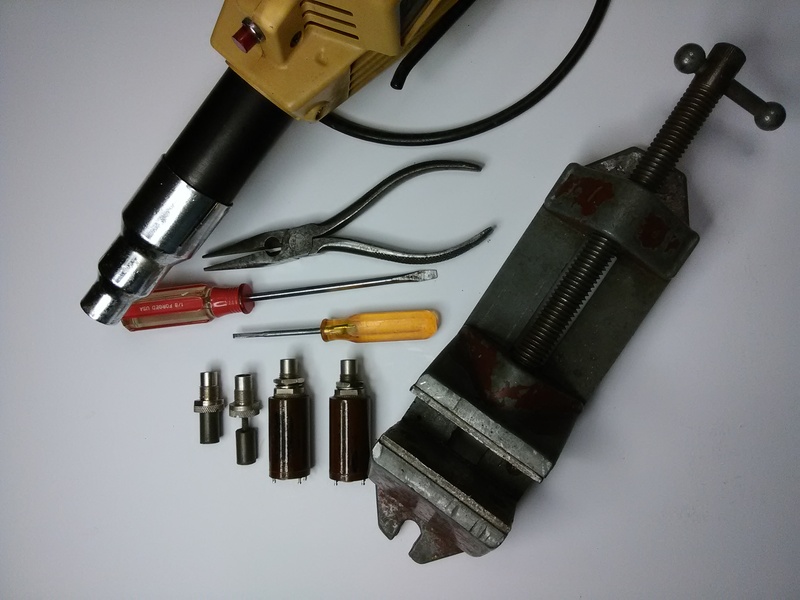 Fourth photo shows all the tools needed to remove the leadscrew from the RF transformer.